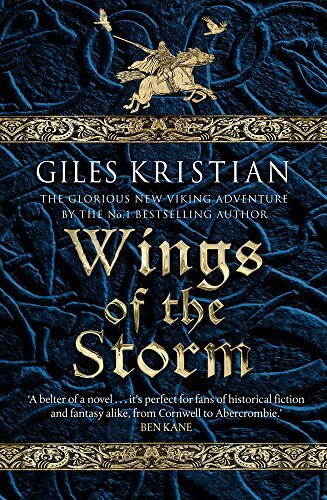 I just finished Wings of the Storm by Giles Kristian, the third book in the Rise of Sigurd series, and what an entertaining yarn it was! The novel follows Sigurd in his quest to avenge the death of his family. It is a quest littered with twists and turns, adventure and battle, and one that kept me engaged from page one. Mr. Kristian does a wonderful job of balancing character and plot. His characters loom large in all three of the books I've read in this series. They are, at their core, a band of likable misfits who share a skill in warcraft and a desire to see Sigurd's goal achieved. That said, each stands out in his or her own unique way, whether through their physique, their skill, their words, or some mixture of all of these traits. I found myself caring for most of them. In fact, I felt a little cheated at the end not to get closure on a few of them. Perhaps we'll meet them again in another novel? I will not give away too much of the plot other than to say that it builds to a satisfying end. After following Sigurd for three novels in his quest for vengeance, I was hopeful the end would deliver a punch, and it did. In some respects, the climax of the novel was a tale in itself, and well worth the journey to get there. One final thought I have is this: The Viking Age was a brutal time and the battles, while small in scale, must certainly have been bloody. Mr. Kristian does not hold back in his description of those fights. While some might be put off by this, it struck me as an accurate attempt at trying to capture the brutality of fighting in close quarters with sharp weapons. There are few authors who can keep my attention the way Mr. Kristian did in his Sigurd series. His characters, the dialogue, the constantly building plot -- all of the these combine in Wings of the Storm to create a novel that was simply hard to put down. Well done! Newer PostRaven's Feast is out! Older PostHere's the cover of Raven's Feast (Hakon's Saga Book 2)!